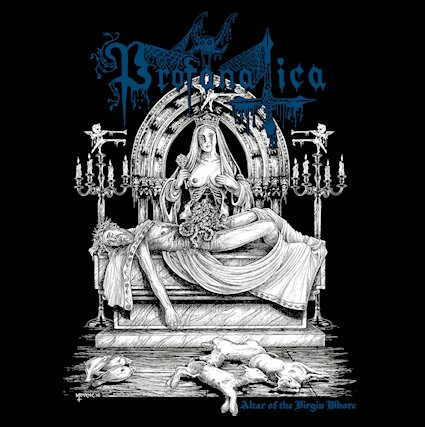 Profanatica are a band from Connecticut that has been around for almost 30 years and plays a very raw and blasphemous form of black/death metal and this is a review of their 2018 ep "Altar Of The Virgin Whore" which will be released in November by Hells Headbangers. A very fast, raw and melodic sound starts off the ep along with a great amount of blast beats while the music also mixes in elements of death metal as well as the vocals being mostly grim black metal screams and all of the musical instruments have a very powerful sound to them. The riffs also bring in a great amount of tremolo picking while the songs also bring in a great mixture of slow, mid paced and fast parts along with a great portion of the tracks being very short in length as well as the music also being very heavily rooted in the early 90's and the songs always stick to a very heavy and raw musical direction. 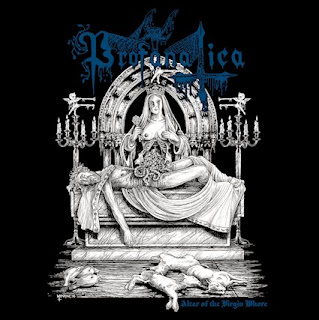 Profanatica creates another recording that remains very true to their raw and blasphemous form of black/death metal, the production sounds very dark and raw while the lyrics cover anti Christianity, blasphemy, darkness and desecration themes. In my opinion this is another great sounding recording from Profanatica and if you are a fan of this band, you should enjoy this ep. RECOMMENDED TRACKS INCLUDE "Conceived With Sin' "Crucifixion Wounds" and "He Has Risen". 8/5 out of 10.